There are four valves in the heart that ordinarily and normally produce the characteristic “lub dub,” produced by the heart valve opening and closing. When a valve doesn’t open or close properly the result is turbulence that produces a “whoosh” sound. Listening carefully allows the murmur to be localized. While any valve can be involved, the most commonly involved valve is the valve between the left atrium and the left ventricle – the “mitral” valve. Most mitral valve insufficiency is due to distortion of the free edge. Most often this is associated with deposits of tissue. Normally, when the heart beats, the ventricles pump the blood out to the arteries. When the valves are unable to create a seal, the pumping effort is less efficient and some of the blood is pumped back up stream into the left atrium. This process is progressive as the valve becomes more abnormal and the result is impaired circulation. To help the circulation keep up, the body retains fluid that ultimately accumulates in the lungs and can lead to congestive heart failure. What are the signs of mitral insufficiency? Diagnostics of mitral insufficiency may require an Electrocardiogram and/or an Echocardiogram to evaluate the strength of the ear and size of the chambers. Other tests include a blood count to evaluate the function of other organs such as the kidneys and liver. Not all cats with mitral insufficiency have congestive heart failure, and in fact not all cats that have a murmur and cough have progressed to heart failure. 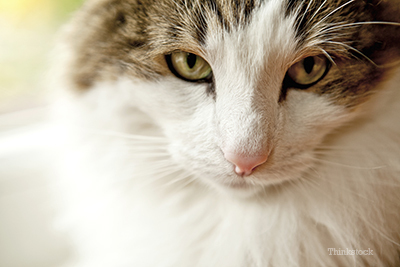 There is a relatively new blood test to evaluate whether a cat has a heart murmur. Referred to as NT-proBNP it is a screening test to differentiate between normal and reduced left ventricular function. This analysis is an excellent prognostic tool in early onset heart failure. This analysis is available commercially and should be considered in affected cats to determine a clinical approach and course. Treatment of valvular disease in humans often involves the surgical repair or replacement of the affected valve. Success rates of these treatment options are not as high in people as they are in cats; however, In cats such procedures are limited in application and availability. The cost of the procedure is between $10,000 and $12,000 which is unfortunately currently beyond the reach of most cat guardians. According to veterinary cardiologists at Tufts University Cummings School of Veterinary Medicine, the primary goals of treating congestive heart failure (caused by mitral insufficiency) are to reduce the buildup of fluid and to increase the amount of blood being pumped by the heart to the lungs and the rest of the body. Medical management of congestive heart failure involves a variety of drugs working in concert to enhance cardiac function. The prognosis of mitral insufficiency with congestive heart failure is unpredictable and at very best guarded. It depends on the severity of the causative condition and response to medical management. However, with appropriate management and lifestyle changes like exercise restriction and weight control as well as sodium intake reduction, affected cats can live an average of 9-10 months.